Andrew Irwin on the Honda Racing Fireblade at Monteblanco in Spain. 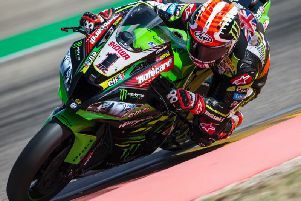 Andrew Irwin says the number of riders from Northern Ireland in next year’s Bennetts British Superbike Championship is ‘something to be proud of’. The Carrick prospect, who has joined Honda Racing for 2019 after impressing as a rookie this season, is one of five Irish riders who will compete in BSB next year, along with his older brother Glenn (JG Speedfit Kawasaki), Keith Farmer (Tyco BMW), David Allingham (EHA Racing) and Josh Elliott (OMG Suzuki). Andrew Irwin and his brother Glenn rode for the PBM Ducati team in the 2018 British Superbike Championship. The 24-year-old said: “It just shows that Northern Ireland always punches above its weight, no matter what sport we are talking about. It’s crazy and to have five riders from our little country is something to be proud of and it does our country proud. Irwin made a big impression this season after he joined the PBM Be Wiser Ducati team as a replacement for Shane Byrne, who was ruled out for the long-term through injury. He was taken under the wing of his brother and team-mate Glenn, and the 2017 British Supersport Championship runner-up made excellent progress as the year progressed. Irwin clinched two fourth places and qualified on the front row at Thruxton. He also battled for the lead of the opening race with Glenn at the final round of the series at Brands Hatch in October, before eventually finishing fourth. The pair have a healthy rivalry, and away from the track Irwin says the brothers are ‘best friends’. “That race [at Brands] was special and it’s something I think we will all remember. It’s just a pity I couldn’t maintain that pace over the last five laps or we could have become the first brothers to finish first and second in BSB,” Irwin said. “It’s racing and I’m sure in 2019 we will have more chances for that and more battles. Glenn wants to win the championship and I want to be in the Showdown and although we are brothers, we are rivals at the same time. As much as I want him to do well, I want to beat him too. “But we have a really good relationship and I think people see that; we aren’t brothers who pretend to get along, we genuinely do and we do a lot of things together. Irwin tested the Honda Racing Fireblade for the first time at Monteblanco in Spain earlier this month.